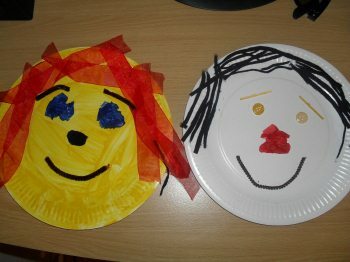 My two little ones made these paper plate faces yesterday (with a little help from mommy). I asked them to make mommy and daddy faces on the plates. The resemblance is uncanny, well daddy looks like that when he gets out of bed anyways. They are really easy to make and you may have some stuff you can use already. I got a bunch of stuff of ebay for just a few dollars (lots still left for other things). My kids used a glue stick, the kind you twist to make it come out the tube. Just like a lipstick works. I then told them to make some eyes and a nose. Then the mouth and the hair (I helped by bending the pipe cleaner into a smile). I know I sould just let them do it but I get carried away. Will have to sit on my hands in future. Join in and write your own page! It's easy to do. How? Simply click here to return to Paper Crafts for Kids Ideas!.